6 silver embossed baptism certificates are folded, and 5 x 7, with lines inside for the details to be filled in. 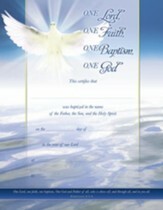 The Scripture verse inside is 1 Corinthians 12:13 By one Spirit are we all baptized into one body. Envelopes are included. I'm the author/artist and I want to review Baptism Certificates Silver Embossed (6).